Here are a few things to consider, which will hopefully help you get the most out of your visit. If you're hiring a costume, it may come with accessories like a matching bag. Sometimes it won't. Maybe the supplied accessories are not quite to your taste. Or perhaps you just want to be unique. Whatever the reason, there is usually scope to customise your outfit if you want to. 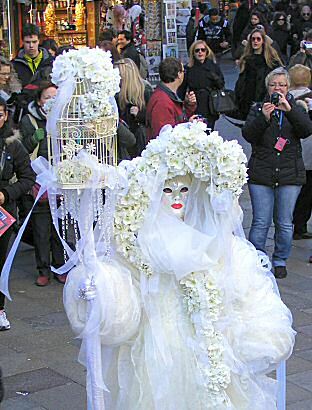 The shops in Venice often have a wide choice of carnival masks, jewellery, footwear and lots more. So there's no problem if you suddenly realise that you're missing a finishing touch. Important and expensive things are often best left somewhere secure, like your hotel safe. But there are often things that you'll want to take with you, or simply can't leave behind: things like hotel keys, spending money, camera and mobile phone. So you'll need some way to carry your stuff discretely but reasonably securely. The normal holiday solutions would be a backpack or beach bag. But these don't usually fit well with a historical costume, so you might want an alternative. For traditional female costumes, the most obvious solution is a handbag that either matches your outfit, or that can be concealed easily (e.g. worn over the shoulder, but underneath a cape). Alternatively, a money pouch or bum bag (U.S. readers will know this as a "fanny pack") strapped around the waist can be ideal, beacause it can usually be hidden under a jacket or cloak and also keeps your hands free. Bum bags and money belts can easily be found in online stores, or in large department stores in the section with suitcases and holiday goods. You can probably pick one up at an airport shop if you get really stuck. We found that they're priced about €10 - 15 for one that has a reasonable amount of storage space and is comfortable to wear. Venice's public transport system is generally well organised and good value. On the main island and between islands, the ACTV vaporetto (water bus) service is often the fastest way to get around. If you're not in a hurry, walking through Venice can take you through picturesque hidden town squares and historic buildings - just take the long way round through the smaller streets. If you're travelling from nearby towns on the mainland, there are frequent buses, trains and trams that will get you to the main transport hubs in the city. From there you can either walk or catch a water bus. Driving from the north, you will have to park on the outskirts of the city (remember: Venice has canals, not roads) and you can catch public transport from there. At busy times, especially early evening, waterbuses can get full and you may have to queue. Bear this in mind if you're travelling to an event. Of course, you can also hire a gondola for some sightseeing. Due to its' size and slow speed, it is not very practical as a main form of transport. 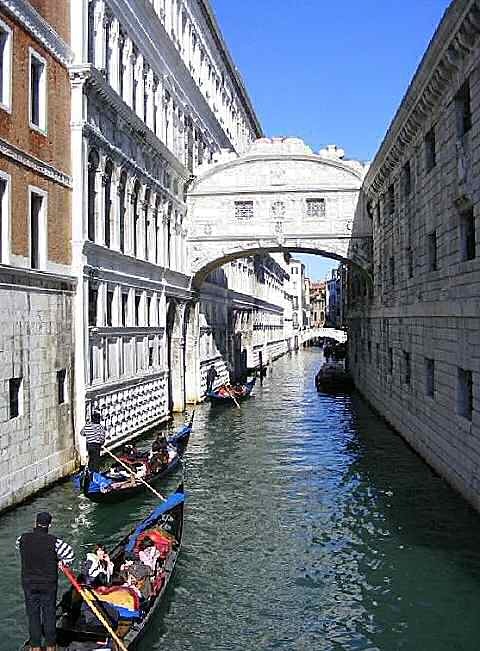 However, it does offer unique views of Venice and lets you get up close to some of the iconic buildings (such as the Bridge of Sighs, pictured). There are plenty of places to eat in Venice, and places to have a coffee and watch the world go by. If you're in costume, we'd suggest going inside because you can relax a bit more away from the spectators and photographers on the street. We used to see people wandering around St Mark's Square drinking cocktails and hot wine, and the vendors would supply drinking straws so that their customers didn't have to remove their masks. This has now disappeared due to problems with littering and food waste, and you can be fined by the authorities for eating or drinking in the streets. You can still buy food and drink to take away, but official advice is to find a public park before you unwrap your Italian goodies. Hotels and guest houses in the city centre are now limited. Although there are some wonderful historic buildings, they get booked up very quickly in Carnival season and often attract a premium price. Local laws have prohibited new hotels from being built because of environmental concerns. Private rentals are increasing, but these have been criticised for making environmental problems worse, because some owners do not contribute back to the city (e.g. by paying taxes); so there are extra tourists, but no extra money for the city's infrastructure. The main alternative is to stay somewhere just outside the main island, but with good transport links. We have previously stayed at Venice Lido, which is a separate and quieter island with good water bus links to St Marks Square that run from early morning to late night. The Alilaguna airport express waterbus also stops here, and there are taxis on the island (the type with four wheels) so you don't have to struggle with luggage. N.B. Lido de Jesolo is not the same as Venice Lido. We've heard good things about Lido de Jesolo, but it is further away from the city centre. And while we're on the subject, there is a tram stop on the mainland, not far from Venice, called San Marco - not to be confused with San Marco square in the city centre.